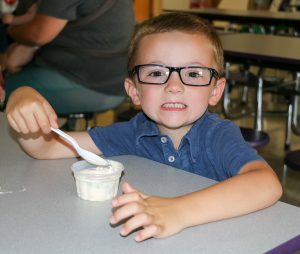 HANNIBAL – The Hannibal Central School District recently welcomed pre-K and kindergarten students into Fairley Elementary School in preparation for the 2018-19 academic year. 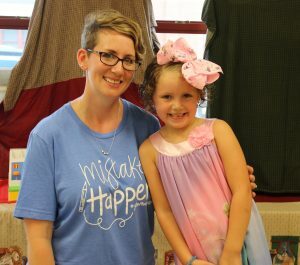 Teacher Emily Fowler welcomes incoming student Kaydance Majchrzak into her classroom at Fairley Elementary School. On Aug. 28, the district’s youngest students joined their parents and teachers at Fairley for an orientation session. Students had a chance to meet their teacher, scope out their classroom, board a school bus and meet their classmates. Principal Amy Bird and Assistant Principal Stephanie Griffin met families and answered any questions. Jordan Trinder is all smiles as he enjoys an ice cream social with his Fairley Elementary kindergarten classmates. 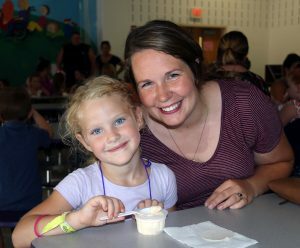 Fairley kindergartner Aubree Oostdyk and her mom, Alyse Oostdyk, enjoy an ice cream social sponsored by Hannibal Home and School prior to the start of the school year.